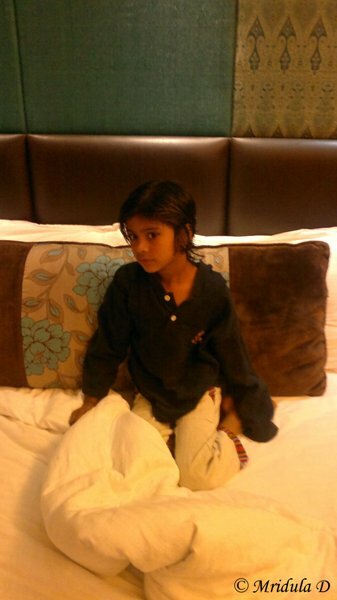 I recently stayed at the Country Inns and Suites Haridwar for one night. When we arrived at the front desk it was 8.00 pm. My six year old daughter and I started off from Deoria Tal at 8.00 am and after 12 hours of traveling in the mountain roads we were dead tired. It is not that I had booked a room with them in advance. Somewhere between Srinagar (there is one in Uttarakhand too) and Haridwar I realized that Chhavi was really tired. She had walked 3 km from the tal to Sari village and we were still many hours away from our destination. I didn’t want to get down at a dark bus station and frighten her or upset her. The Booking Experience: I called my sister and asked her to search for Country Inns and Suites Haridwar and text me their number. Once I got the number I called them from the bus and asked if they had a vacant room. When they said yes I requested them to hold a room for me. They simply asked for my name and confirmed my cell number and promised me a room on arrival. I have to say they were not at all fazed at this unconventional booking demand. When we were getting close to Haridwar I asked the conductor to drop us by the hotel. I knew it was on the way as I had noticed it on my previous trips. Now the conductor had no clue which hotel I was talking about. As it was pitch dark by now I was panicking mildly. I called the hotel and asked their front desk if they would talk to the conductor? They readily agreed. I was also able to spot the hotel in advance and I got down without much hassle. The Check-in: I am sure I looked like a big apparition and Chhavi a little cute apparition when we approached the front desk. After formalities like taking my Id proof, filling a few things in the form, I offered to take out my card so that they could hold some money on it. They told, “ma’am you are very tired, you can go to your room first. I am sure you are going to order room service. After dinner if you feel like do come down and we can do the formalities.” Now that was such a thoughtful offer, I accepted it with speed. The Room: I had a deluxe room and for my daughter and me it was big. It was well lit and cheerful. We quickly took the much needed hot water shower. I was a bit surprised that there was just one soap in the bathroom but otherwise it was clean and no major complains at all. Then we ordered food. I put cartoon on TV for Chhavi. She really liked the room. In spite of being very tried she wanted to explore every nook and corner. That she didn’t cry even once was my reward for spending on one night what I almost did on the entire trek. The tariff after tax came to 4200 Indian rupees for me. Because of my blog I have stayed with quite a few fancy hotels but otherwise I am much more of a budget traveler. But if need be I will stay with Country Inns and Suites Haridwar again. The Room Service: The food I ordered arrived fast and it was OK. I over ordered once again to pamper Chhavi. She had noodles and I had rice and green Thai curry. We were able to finish most of the food but the Thai curry was on the spicy side for me. I guess it is better to order Indian food but the girl wanted to eat noodles and I went along with the spirit. Overall, the food was fine. The Post Dinner Interaction: Chhavi and I went down to the reception to settle the bill. They were quite courteous all through. I also booked a cab for the Haridwar Railway Station for 5.00 am as we had a 6.00 am train to catch. They told me it would cost me 1000 rupees. But I was more worried about missing the train and our safety rather than the cost. As breakfast was included in the room rent they offered to pack some breakfast for our early departure. Now on my own it would never occur to me to ask for a packed breakfast. I really liked their offer and thoughtfulness. My daughter loved it. She also spent 5 minutes in the train trying to repack an apple! And you know if a child can keep relatively still for five minutes, what a blessing it is! The Departure: When I got down at 5.00 am one person from the front desk was already waiting for me. Even at that early hour he asked about my stay cheerfully. I told him I did it for my daughter and she really liked it. They asked if I consumed anything from the minibar. Both of us started laughing as with a child of course she was interested in taking out everything from the minibar. I told him that I managed to leave it intact though with great difficulty. My packed breakfast was ready and the taxi was waiting for me. It was time to say bye to the hills. For me two things stood out during this stay. One was the offer to worry about the payments later and the second about the packed breakfast. Both were considerate offers. They were over and above the standard normal service. Overall, I really liked my stay, more importantly my daughter had a great time. So thank you Country Inns and Suites Haridwar for a wonderful stay at your hotel. Your staff is really good. PS. It was really nice to be treated with consideration as a paying customer. After all they had no idea that I have a travel blog!